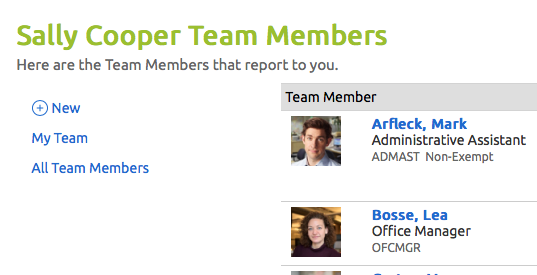 BLOOM allows Administrators to safely "open up" all team members to managers and gives access to all team member information when an ever-changing reporting structure exists. This is especially relevant to multiple shift, 24/7 operations. This feature allows any manager to give input about any team member performance beyond their primary and secondary reports. This page will display everyone with a Personal security level. Clicking on the name will take you to the manager screens for the team member where you can record performance journals, participate in dialogues, view goals, and more! How do you turn on this feature? Go to the Manager View Personal section. 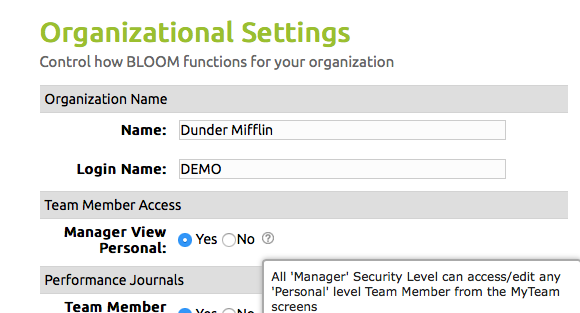 Turning this to "Y" will allow anyone with a MANAGER security level to access any team member with a PERSONAL security level in the MY TEAM section. This ensures that the manager will not have any visibility to view any other manager, executive, or administrator of the organization.